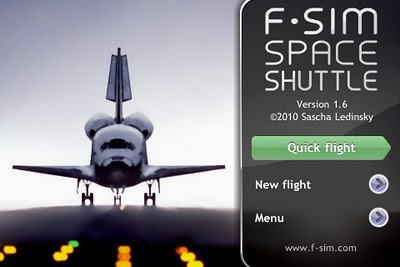 I've now got about 6 hours of "flight time" in F-SIM Space Shuttle on the iPod Touch - which is a lot of flights at about 2 minutes each (about 165 flights). I'm still mainly doing final approaches, trying to become consistent enough to get mostly "safe" (and eventually "good" and "perfect") landings and fewer "hard" landings (but still a fair amount of "crash" landings when I lose focus). So far my top score is 193,000 - nowhere near the one million that's apparently possible on a really perfect landing. I wish I had a faster learning curve, but it's still fun. OK, an obsession, but fun. It really requires close concentration and a delicate, balanced touch when tilting the very low-mass iPod Touch to control your flight.It also helps to read the instructions and to watch the Autoland demo multiple times. Every time I do I notice some other little point that helps me improve. I'm still a little weak on the final flare - timing and amount, and also drifting right or left on that pull. It's very touchy. 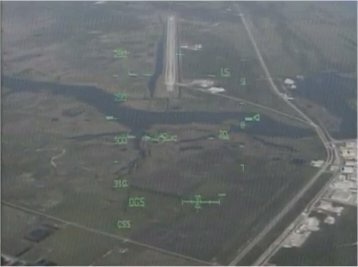 One thing I did was to look up some HUD video of real shuttle landings on YouTube (here's a good example, and this one starts at about 80K feet at about Mach 2, before the entry to the HAC, and has a lot of pilot conversation). This really confirms the excellent realism of the HUD and the overall "sight picture" and speed sensation in the sim. Unfortunately the runway overlay is still on in this shot, but turned off in the real screen shot (I only seem to be able to make screen shots in the Autoland demo, not on my live flights and it's hard to get exactly the same conditions). 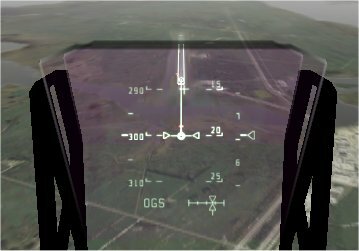 The HUD frame (needed for orientation on a tilting screen) and symbology brightness are also different, but you can still see the realism.